به دلیل پرهزینه و زمان­بر بودن عملیات صحرایی و نیز احتمال خطر بالای آن در اکتشاف مواد معدنی، شناسایی مناطق مستعد کانه­ز­ایی مواد معدنی اهمیت به سزایی دارد. بنابراین تهیه نقشه پتانسیل معدنی با استفاده از سامانه اطلاعات مکانی برای تلفیق همه فاکتورهای اکتشافی امری ضروری است. روش­های مختلفی به منظور پتانسیل­یابی مواد معدنی تاکنون گسترش یافته­اند که یکی از مؤثرترین آنها با توجه به طبیعت پدیده­های زمین­شناسی و معدنی، روش سلسله مراتبی و سلسله مراتبی فازی است. در این پژوهش برای تهیه نقشه مناطق امیدبخش مس- طلای پورفیری در برگه 1:100000 جنوب سه­چنگی از روش­های تصمیم­گیری فرایند تحلیل سلسله مراتبی و تحلیل سلسله مراتبی فازی استفاده شده است. لایه­های شاهد در محدوده مورد مطالعه همچون لایه‎های زمین­شناسی (سنگ منشأ گرما و سنگ میزبان)، دگرسانی، زمین‌ساخت و لایه ژئوشیمیایی با استفاده دو روش تحلیل سلسله مراتبی (AHP) و تحلیل سلسله مراتبی فازی (FAHP) بسته به نوع هدف (مس- طلا پورفیری) وزن­دهی و سپس با یکدیگر تلفیق شدند. در نقشه تلفیق پایانی حاصل از این دو روش بخش­های دارای بی‎هنجاری با استفاده از روش فرکتال تفکیک شدند. مقایسه نقشه پایانی مناطق امیدبخش مس- طلای پورفیری حاصل از این دو روش نشان می­دهد که نتایج حاصل از روش تحلیل سلسله مراتب فازی به مراتب دقیق­تر از روش فرایند تحلیل سلسله مراتبی بوده است. بی­هنجاری‌های حاصل از این روش اعتبارسنجی شد؛ بی­هنجاری شماره 1 حاصل از روش تحلیل سلسله مراتب فازی به واسطه پژوهش­های پیشین انجام شده، تأیید شد. نتایج تجزیه نمونه­های سنگی برداشت شده از محل بی­هنجاری شماره 2 نشان می­دهد که نمونه­ها دارای غنی‌شدگی مس هستند و همچنین عناصر طلا و آرسنیک نیز غنی‎شدگی دارند. این نتایج به همراه کارهای پیشین انجام شده تأیید کننده نقشه پتانسیل­یابی معدنی حاصل از روش فرایند تحلیل سلسله مراتب فازی است. Due to high cost, risk and time consuming nature of field operations and mineral explorations, the discovery of probable mineralization area is profoundly important. Thus, preparations of potential mineral map by means of GIS techniques for compilation all exploration factors is an essential matter. Various methods of mineral potential assessment have been developed. One of those most efficient techniques, based on nature of geology and mineral phenomena, is Analytical Hierarchy process (AHP) and Fuzzy Analytical Hierarchy process (FAHP). In this investigation, in order to prepare probable porphyritic gold copper zones map in 1:100000 sheet of south of Sehchangi, AHP and FAHP have been implemented. In the study area, the witness layers including geology layers (thermal source rock and host rock), alteration, tectonic and geochemical layers depending on target (porphyritic gold- copper mineralization) are weighted and then compiled by aid of AHP and FAHP. In final compiled map resulted by two mentioned methods, the anomalous zones are separated by fractal method. The comparison of final maps of probable porphyritic gold - copper mineralization zones indicate that the results derived byFAHP is significantly more precise than AHP. Anomalous zones derived by this method (FAHP) are evaluated, anomalous zone 1 derived by FAHP is approved by previous analysis. The analysis results of mineralized samples of anomaly 2 indicate that samples have experienced copper enrichment and moreover, gold and arsenic elements are enriched as well. The results presented here and results of previous analyses approve mineral potential assessment derived by Fuzzy Analytical Hierarchy process (FAHP). حسنی‎پاک، ع. ا. و شرف‎الدین، م.، 1380- تحلیل داده­های اکتشافی (جدایش زمینه از آنومالی، آمار و احتمال مهندسی، تخمین ذخیره)، انتشارات دانشگاه تهران. حسینخانی، ا.،کریم­پور، م. ح. و ملک‌زاده شفارودی، آ.، 1394- سنگ­شناسی، کانی­شناسی، منطقه­های دگرسانی و پی­جویی ژئوشیمیایی در منطقه جنوب باختری سرخ­کوه، شرق ایران، مجله بلور شناسی و کانی­شناسی ایران. سازمان زمین شناسی و اکتشافات معدنی کشور، 1382- گزارش اکتشافات سیستماتیک در برگه 1:1000000 جنوب سه­چنگی. شایسته‌فر، م. و رسا، ا.، 1384- تحلیل داده­های چند­متغیره­ی کانسار سرب و روی قنات مروان کرمان، نشریه­ی علوم زمین، شماره­ی 57، صص. 134 تا 145. ظریفی، ض.، صباغان، م. و درویش‌زاده، ع.، 1386-کاربرد تحلیل هندسه فرکتال در جداسازی ناهنجاری­های عنصر اورانیوم با استفاده از داده­های ژئوفیزیک هوایی در اکتشاف ناحیه­ای اورانیوم منطقه اونلیق (آذربایجان شرقی)، مجله ریاضیات کاربردی واحد لاهیجان، سال چهارم، شماره 12. فاضل، ا.، یدالهی، ر. و اقبالی، م. 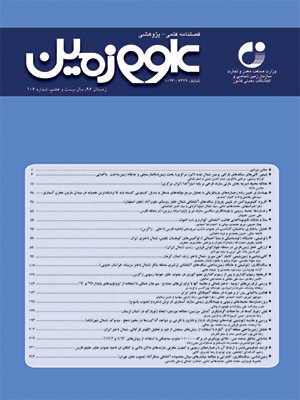 ع.، 1388- مطالعه کانی­سازی پلی­متال سرخ­کوه (خوسف- بیرجند) به عنوان گرانیت تیپ s، بیست و هفتمین گردهمایی علوم زمین و سیزدهمین همایش انجمن زمین‌شناسی، سازمان زمین­شناسی و اکتشافات معدنی کشور. قدسی‎پور، ح.، 1388- مباحثی در تصمیم­گیری چندمعیاره، فرایند تحلیل سلسله مراتبی، انتشارات دانشگاه صنعتی امیرکبیر، چاپ هفتم، 220 ص.
Abdi, M., Karimpour, M. H. and Najafi, A., 2010- Geology, alteration and mineralization potential of Kuh-Shah region. South Khorasan. First Symposium of Iranian Society of Economic Geology, Mashhad, Iran, p. 1–7. Aghanabati, A., 2004- Geology of Iran. Ministry of Industry and Mines. Geological Survey of Iran, p.142. Agterberg, F. and Bonham-Carter, G., 1999- Logistic regression and weights of evidence modeling in mineral exploration. Proceedings of the 28th International Symposium on Applications of Computer in the Mineral Industry (APCOM), Golden, Colorado, p. 483-490. An, P., Moon, W. and Rencz, A., 1991-Application of fuzzy set theory to integrated mineral exploration. Canadian Journal of Exploration Geophysics, V. 27, p. 1–11. Arjmandzadeh, R., Karimpour, M. H., Mazaheri, S. A., Santos, J. F., Medina, J. M. and Homam, S. M., 2011- Sr–Nd isotope geochemistry and petrogenesis of the ChahShaljami granitoids (Lut Block, eastern Iran). J. Asian Earth Sci,V. 41, p. 283–296. Ayag, Z. and Ozdemir, R. G., 2006- A fuzzy AHP approach to evaluating machine tool alternatives. J. Intell Manuf. Batuhan, A., 2013- A Fuzzy AHP approach for supplier selection problem: a case study in a gearmotor company, International Journal of Managing Value and Supply Chains (IJMVSC), V.4, No. 3. Beiranvand Pour, A. and Hashim, A., 2012- Identifying areas of high economic-potential copper mineralization using ASTER data in the Urumieh–Dokhta Volcanic Belt, Iran. Advances in Space Research, 49, p. 753–769. Berberian, M., Jackson, J. A., Qorashi, M., Khatib, M. M., Priestley, K., Talebian, M. and Ghafuri-Ashtiani, M., 1999- The 1997 may 10 Zirkuh (Qaenat) earthquakes (Mw 7.2): faulting along the Sistan suture zone of eastern Iran. Geophys. J. Int, 136, p. 671–694. Bonham-Carter, G., 1994- Geographic Information Systems for Geoscientists: Modelling with GIS. Pergamon, Ontario, Canada. p. 98. Bonham-Carter, G., Agterberg, F. and Wright, D., 1989- Weights of evidence modeling: a new approach to mapping mineral potential, Statistical applications in the Earth Sciences. Geological Survey of Canada Paper, V. 89, p. 171–183. Camp, V. and Griffis, R., 1982- Character, genesis and tectonic setting of igneous rocks in the Sistan suture zone, eastern Iran. Lithos, V. 15, p. 221-239. Carranza, E. J. M., 2009- Controls on mineral deposit occurrence inferred from analysis of their spatial pattern and spatial association with geological features. Ore Geol. Rev, V. 35, p. 383-400. Carranza, E. J. M., 2008- Geochemical anomaly and mineral prospectively mapping in GIS. In: Handb. Explor. Environ. Geochem. Elsevier, Amsterdam, Netherlands, p. 368. Chang, D., 1996- Applications of the extent analysis method on fuzzy AHP.open journal of operational, p.649-655. Harris, J. R., Wilkinson, L., Heather, K., Fumerton, S., Bernier, M. A., Ayer, J. and Dahn, R., 2001- Application of GIS processing techniques for producing mineral prospectivity maps, a case study: mesothermal Au in the Swayze Greenstone belt, Ontario, Canada, Natural Resource Research V.10,p. 91-124. Karimi, M., Menhaj, M. and Mesgari, M., 2008- Mineral potential mapping of copper minerals using fuzzy logic in GIS invironment, Beijing, China: ISPRS, p.170-181. Karimpour, M. H., Larg, R. R., Razmara, M. and Pattrick, R. A. D., 2005- Bi sulfosalt mineral series paragenetic associations in specularite-rich Cu–Ag–Au deposit, QalehZari mine, Iran. Soc. Crystallography Mineral, V. 13 (2), P.417–432. Karimpour, M. H., Malekzadeh Shafaroudi, A., Mazaheri, S. A. and Haidarian Shahri, M. H., 2007- Magmatism and different types of mineralization in Lut Block. In 15th Symposium of Iranian Society of Crystallography and Mineralogy, Ferdowsi University of Mashhad, Iran. Laarhoven, P. J. M. and Pedrycz, W., 1983- A fuzzy extension of Saaty’s priority theory. Fuzzy Sets and Systems, V.11, P.229–241. Lu, L., Zhi-hua, Sh., Wei, Y., Dun, Zh., Sai, L. N., Chong-fa, C. and a-lin, L., 2009- A fuzzy analytic hierarchy process (FAHP) approach to eco-environmental vulnerability assessment for the Danjiangkou reservoir area. China. Eco logical modeling, V. 220, P. 3439-3447. Malekzadeh Shafaroudi, A., Karimpour, M. H. and Stern, C. R., 2014- The Khopik porphyry copper prospect, Lut Block, Eastern Iran, geology, alteration and mineralization fluid inclusion, and oxygen isotope studies. Ore Geol. Rev. Malekzadeh, A., Karimpour, M. H. and Mazaheri, S. A., 2010- Rb–Sr and Sm–Nd isotopic compositions and Petrogenesis of ore-related intrusive rocks of gold-rich porphyry copper Maherabad prospect area (north of Hanich), east of Iran. J.Crystallogr. Mineral. V.18, P.15–32. Pazand, K., Hezarkhani, A., Ataei, M., 2012- Using TOPSIS approaches for predictiporphyry Cu potential mapping: a case study in Ahar-Arasbaran area (NW, IraComput). Geosci, P. 49, 62–71. Porwal, A., 2006- Mineral potential mapping with mathematical geological models, Ph.D. Thesis, University of Utrecht, The Netherland, p. 289. Porwal, A., Carranza, E. J. M. and Hale, M., 2003- Knowledge-driven and data-driven fuzzy models for predictive mineral potential mapping. Natural Resources Research, Springer, V.12, P. 1–25. Richards, J. P., Spell, T., Rameh, E., Razique, A. and Fletcher, T., 2012- High Sr/Y magmas reflect arc maturity, high magmatic water content, and porphyry Cu ± Mo ± Au potential: examples from the Tethyan arcs of central and eastern Iran and western Pakistan. Geol, V. 107, P.295–332. Saaty, T. L., 1977- A scaling method for priorities in hierarchical structures. J Math Psychol, V. 15, P.234-281. Samiee, S., Karimpour, M. H., Ghaderi, M. and Haidarian Shahri, M. R., 2011- Geology, alteration and mineralization potential in Khonic area, south of Birjand, The second Congress of economic geology of Iran. Zadeh, L. A., 1965- Fuzzy sets. Information and Control. V. 8, P.338-353.